In mitosis, I understand that the centromeres line up on the spindle. I also know that the centrioles form microtubles between the centromeres during mitosis in the metaphase. But, are microtubles and spindles the same thing? Or do microtubles make up spindles? Spindle fibers form a protein structure that divides the genetic material in a cell. [...] At the beginning of nuclear division, two wheel-shaped protein structures called centrioles position themselves at opposite ends of the cell forming cell poles. Long protein fibers called microtubules extend from the centrioles in all possible directions, forming what is called a spindle. Some of the microtubules attach the poles to the chromosomes by connecting to protein complexes called kinetochores. Kinetochores are protein formations that develop on each chromosome around the centromere, which is a region located near the middle of a chromosome. 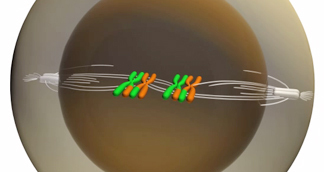 Other microtubules bind to the chromosome arms or extend to the opposite end of the cell. During the cell division phase called metaphase, the microtubules pull the chromosomes back and forth until they align in a plane along the equator of the cell, which is called the equatorial plane. Not the answer you're looking for? Browse other questions tagged biochemistry molecular-genetics terminology mitosis or ask your own question. Number of spindle fibres during Metaphase? Can cell division be stopped during prophase?